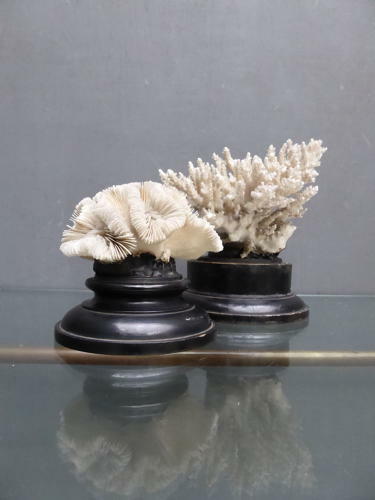 A beautiful pair of antique coral specimens mounted on ebonized wooden bases. Two fantastic specimens, beautifully displayed on their turned & ebonized bases with both the coral and bases displaying a wonderful age related patina. Wear commensurate with age, minor wear & losses as you'd expect, both display beautifully. The specimens measure around 17cm x 16cm x 13cm & 11cm x 10cm x 9cm respectively (including the bases).